The sunny weather and warm Mediterranean climate is a major contributing factor why so many people holiday in Amalfi each year. 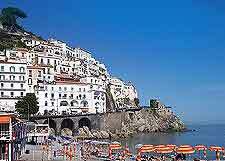 Amalfi's winters are warm and pleasant, while the summer weather is warm and often hot, but rarely uncomfortable. Each season in Amalfi has something different to offer, with the winter climate seeing daytime temperatures of around 12°C / 54°F, rising to around 29°C / 84°F or even 30°C / 86°F during August. The summer sunshine attracts the largest number of tourists, who come here to bask on the beaches and swim in the crystal clear Mediterranean Sea. Many popular events take place during the summer season, taking full advantage of the appealing climate and plentiful sun. 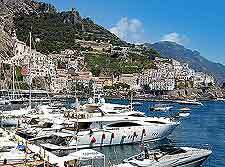 Tourists can be virtually guaranteed fine weather if they visit Amalfi at this time of the year. However, the best beachfront hotels can soon fill up in the summer, due to the increased numbers. During the winter months, between December and February / March, Amalfi slows down greatly and almost becomes another town, with an entirely different feel. Some hotels and even a number of restaurants choose to close during the quieter winter months, although plenty remain open to meet the reduced demand. The springtime climate of Amalfi soon begins to warm up to anywhere above 18°C / 64°F, although it can be a little rainy on occasion. May can be a busy time, when the Italian students school arrive here, enjoying their school holidays.